Bigfoot News | Bigfoot Lunch Club: Dave Shealy's Skunk Ape Research in the News, May is Skunk Ape mating Season. Dave Shealy is a scam artist who makes a meager living fooling people into thinking he knows what he's talking about. I've had some of his closest friends tell me so. For a self-proclaimed "expert" he hasn't brought forth any new evidence since his infamously bogus pics of a "Skunk Ape". 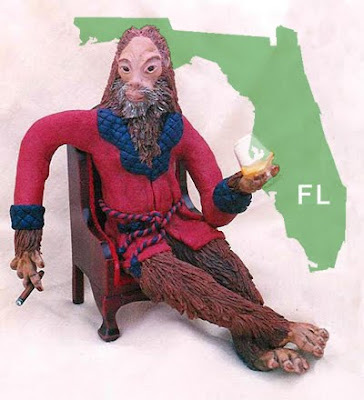 Anyone who's actually seen the Sasquatch here in FL will tell you that his pics are fake. You don't have to go way out into the everglades to have an encounter in Florida either...they're all over this state. I'm not saying that Shealy has never seen the Sasquatch or had personal encounters, but like so many other "experts" in this field, he faked the "money shots" in order to get attention, which he did quiet successfully. Congrats to him for that! Personally, I don't Know how anyone who sees it Could have the presence of mind to take its picture. I Saw it back in 1996, And my only thought was that I was glad it was Far away enough that I had a good head start as I turned and ran,as did the Friend I was with. I will never forget what we Saw and how I felt. Absolute terror! I could care less when it mates, the fact that it exists is enough to keep me out of the Swamp.